Home › Investing › Is Stash One Of The Best Investment Apps? Is Stash One Of The Best Investment Apps? Beating the stock market is a difficult task which is why a host of digital advisors have sprung up to serve investors who prefer a hands-off approach to building retirement wealth. Among the best of these automated investing solutions is Stash Invest, a mobile app available on iOS and Android. What sets Stash apart from most other digital investment managers is that it is designed for the on-the-go client, who wants to link into investment accounts from anywhere and has a keen preference for thematic investing. Stash makes it easy to invest in environmentally friendly companies as well as various other thematic investments, such as leisure companies, entertainment providers, travel companies and renewable energy suppliers. And Stash is available at a price point that is hard to beat – it costs just $1 per month to get started for investors with account balances under $5,000 and 0.25% annually for higher amounts. Stash Invest is a mobile app that connects to your bank account. The standout feature of Stash is thematic investing so you can align your values with your dollars. Unlike a standard robo-advisor, Stash requires you to select investments and helps you make decisions with Stash Advisor, which provides educational content. For most financial advisors and robo-advisors, the standard approach to building client portfolios is to select a diversified group of exchange-traded funds featuring stocks and bonds that align with your financial goals, risk profile and time horizon. Generally, they rely on Nobel-prize winning research, called Modern Portfolio Theory, to target appropriate risk-adjusted returns. But what if you want to branch out from the plain vanilla approach and invest your dollars so they are aligned with your values? How do you avoid allocating your savings to so-called sin stocks that feature tobacco and alcohol? And how do get exposure to areas you favor, such as entertainment or leisure? The answer to all those questions is Stash, which is why it rates as one of the best investment apps along with Acorns. It is simple to get started with Stash. 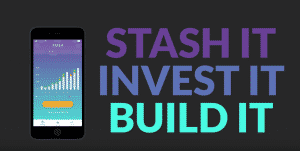 After visiting the Apple AppStore on your iPhone or Google Play if you have an Android phone, simply download the Stash Invest app. Then connect your bank account and choose your investments. You can begin investing with as little as $5 and allocate your money to thematic investments you believe in. Clean and Green features environmentally friendly stocks. Colossal China provides access to Chinese related companies. Data Defenders gives you exposure to cyber-security companies. Do The Right Thing lets you invest in companies making a positive environmental and societal impact. Defending America provides you exposure to aerospace and defense stocks. Equality Works makes it possible to include LGBT friendly companies in your portfolio. Home, Sweet Home connects you to companies building homes. Live Long & Prosper features healthcare stocks. A nice feature at Stash Invest is fractional shares, meaning that you can invest a fixed dollar amount as low as $5 and not worry about whether you can afford to buy a full share of a high-price fund. If you want to take a step back from manual investing, Auto-Stash enables you to automatically invest a fixed dollar amount that you can afford on a regular schedule. Money is debited from your bank account and invested without you having to take any action. For beginners who are not sure which investments to select or indeed experienced investors looking for new ideas, Stash Advisor guides you with tips and recommendations in the “Learn” section of the app. Stash Invest charges 0.25% of assets annually for account balances of $5,000+ and $1 monthly for amounts under $5,000. Stash has two pricing structures depending on how much you invest. For investors with account balances up to $5,000, Stash charges a low monthly rate of $1. Amounts of $5,000 and above incur annual charges of 0.25%, which is in line with the fees charged by industry leading robo-advisors, such as Betterment and Wealthfront. Although $1 monthly may not seem like a whole lot, it can result in high percentage costs annually. For example, an investor with $1,000 will be charged $12 for the year or 1.2% of assets, a charge more in line with traditional advisors than digital advisors. Expense ratios of funds used by Stash in client portfolios range from 0.07% to nearly 1%, with an average just under 0.40%, making Stash among the more expensive digital advisors when it comes to cost of ETFs. >> More: What Are The Best Low-Cost Robo-Advisors? Drawbacks to Stash include: exchange-traded funds used by Stash tend to have higher expense ratios than industry norms, user experience at signup makes it seem as if an ongoing commitment to invest is required, and no retirement account options are available. Stash makes taxable and Roth IRA accounts available. If you are a retirement investor looking for a 401(k) account, you should look elsewhere, such as Blooom. If you have traditional IRAs, rollover IRAs, trusts, or SEP IRAs, Betterment or Personal Capital are solid choices. Another drawback at Stash is the comparatively high cost of expense ratios compared to industry leaders, such as Vanguard. The average expense ratio at Stash is 0.39%, which is larger than the cost incurred by clients at many low-fee robo-advisors. Though Stash offers a delightful and intuitive interface post-setup, it does require you to overcome a few initial hurdles to get started. A stumbling block is that your fees are deducted from your bank account not your investment account which is the industry norm. This could add up to a pretty penny if you have large account balances. For example, a $300,000 portfolio would translate to $750 in annual costs. Another issue is that you are also required to commit to an auto-deposit schedule which you can later opt-out of – though the opt-out feature is not obvious during the onboarding stage. Without knowing how much expense ratios are or what selections are available to you, this feels a little bit like putting the cart before the horse. Stash Invest is a mobile app that makes it easy to invest in thematic investments that align with your values and preferences. From environmentally friendly investment options to access to Chinese companies, Stash has a wide breadth of investment selections. Stash does not automate money management as robo-advisors do but rather it educates you via Stash Advisor to select investments that match your risk profile, time horizon and align with your financial goals. For amounts over $5,000, management fees are in line with industry norms, though it is possible to get started with lower amounts. Expense ratios tend to be above average, which is a blotch on a compelling mobile app offering overall. Once you get past the initial sign-up process, it tends to be smooth sailing at Stash with a delightful interface that is easy-to-use and highly intuitive. For investors on-the-go with an eye on retirement, Stash is a top notch app that wins our votes.